2014 Update: Buy Franke James’ award-winning book Banned on the Hill: A True Story about Dirty Oil and Government Censorship. 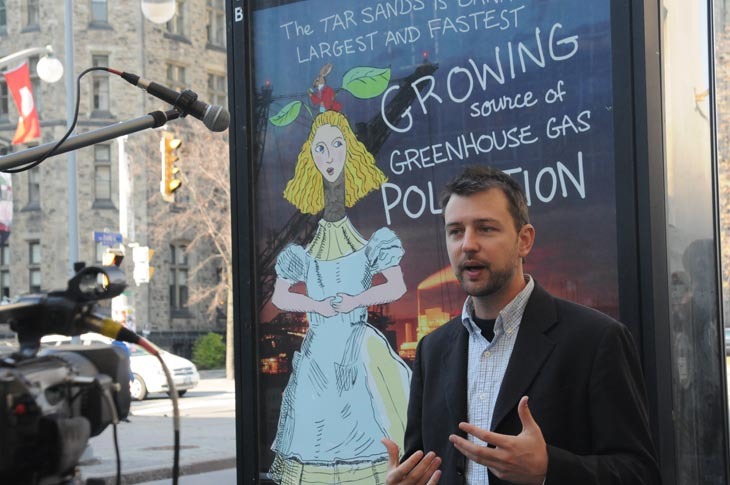 NOVEMBER 4, 2011: “Banned on the Hill” protests the Harper Government’s censorship of Franke James art work, and the muzzling of environmental scientists. 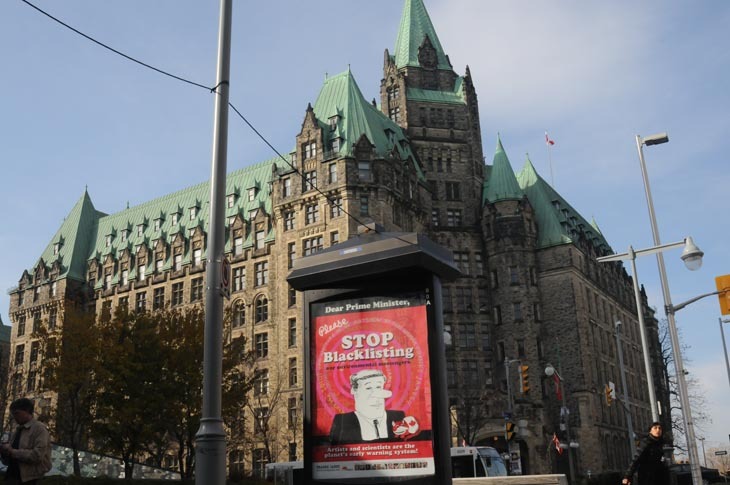 ‘Banned on the Hill’ show hits Ottawa! In exquisite timing which shows that truth-is-stranger-than-fiction, I got my Access to Information documents at the 11th hour before my crowd-funded protest artshow hit Ottawa (big thanks to Colin Mutchler at Loudsauce!) I opened the show yesterday. The bottom-line: The ATI docs prove that Government officials in the Climate Change office killed funding for my show. CBC, Sun TV, Postmedia, MetroNews Ottawa, Carleton University Radio and others showed up for the opening. Show Business students from Montreal interviewed myself, Colin Mutchler and Charles Montpetit for a documentary on Arts Censorship in Canada. There are six backlit posters in the “Banned on the Hill” show. They will be up until November 27th. It was a fabulous day! That’s me (Franke James) laughing as I opened my “Banned on the Hill” artshow in Ottawa on November 2/11. 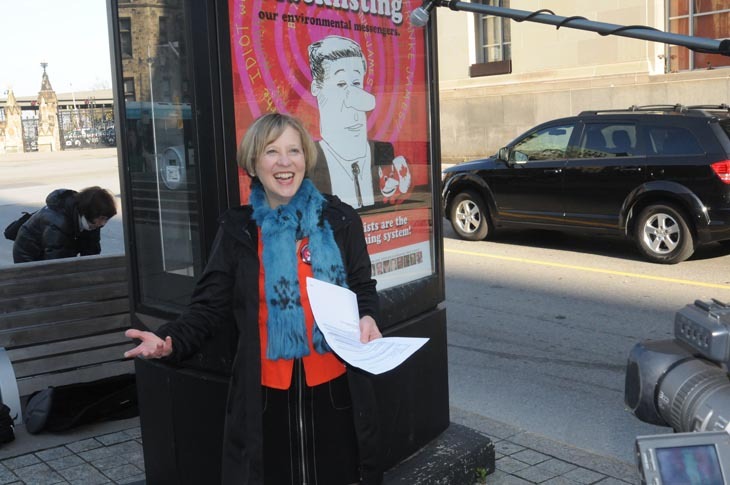 I gave a walking tour describing my art and the “blacklisting” by the Harper Government. Film students from Montreal working on a TV documentary about arts censorship travelled to Ottawa to interview me, Colin Mutchler and my supporter, author Charles Montpetit on November 2, 2011. Colin Mutchler, co-founder, Loudsauce, in front of “Dear Prime Minister: Alice in Hell: The Dirtiest Oil on Earth” which is based on artwork from my 2008 Dear Prime Minister visual essay. 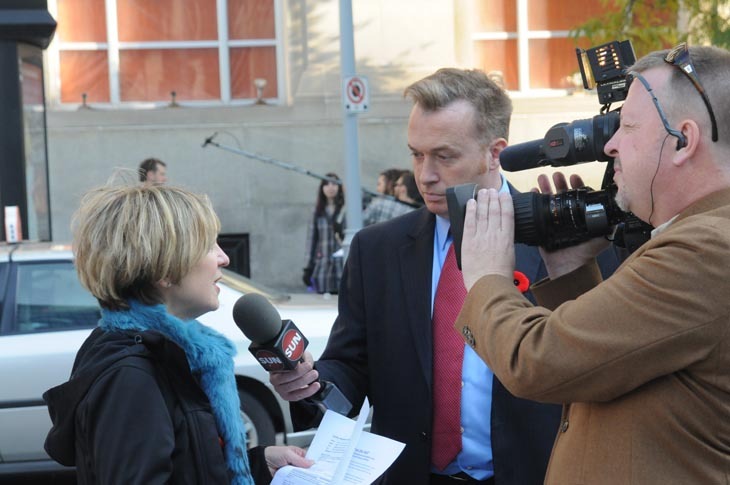 Hearing that SUN News was coming to interview me was a big surprise. But Brian Lilley, Host of Byline and I got along fine. Watch the interview. 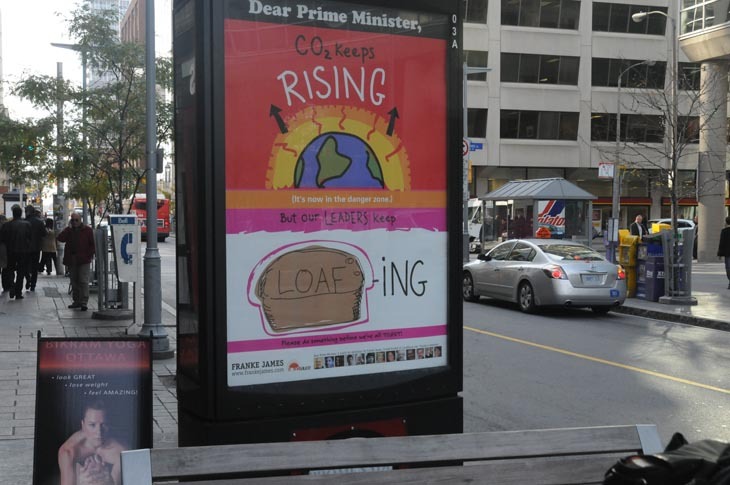 Here I am with Colin Mutchler, Loudsauce, in front of “Dear Prime Minister: Many Canadians joke that we could use a little global warming because the hard truths have been played down” from my 2009 Fat Cat Canada’s Giant Litter Box visual essay. I’m in front of my poster, “Dear Prime Minister, Please stop blacklisting our environmental messengers!” I’m holding one of the documents obtained through the Access to Information Request. See the highlights here. CBC News in Ottawa showed up to interview me and Colin Mutchler. 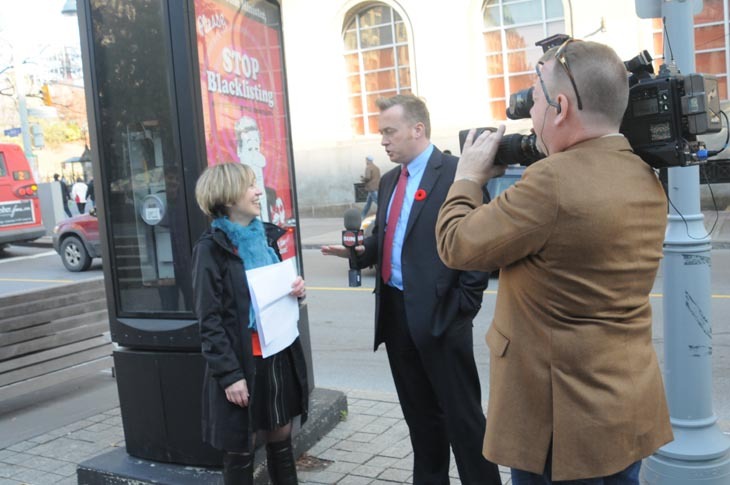 Ottawa Metro News interviewing me. I’m wearing my “Who’s the idiot who blacklisted Franke James?” button. See my Blacklisting Party for the matching poster. Brian Lilley, Host of Byline promised not to edit my comments at all. I think he kept his word. Watch the interview. I’m in front of “Dear Prime Minister: Alice in Hell: The Dirtiest Oil on Earth” from my 2008 Dear Prime Minister visual essay. I’m holding one of the documents obtained through the Access to Information Request. 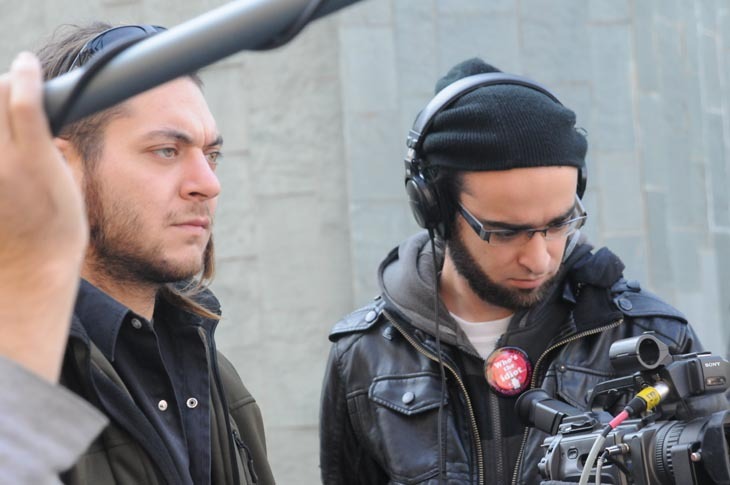 Close-up of Max Power, one of the film students from Montreal working on a TV documentary about arts censorship. 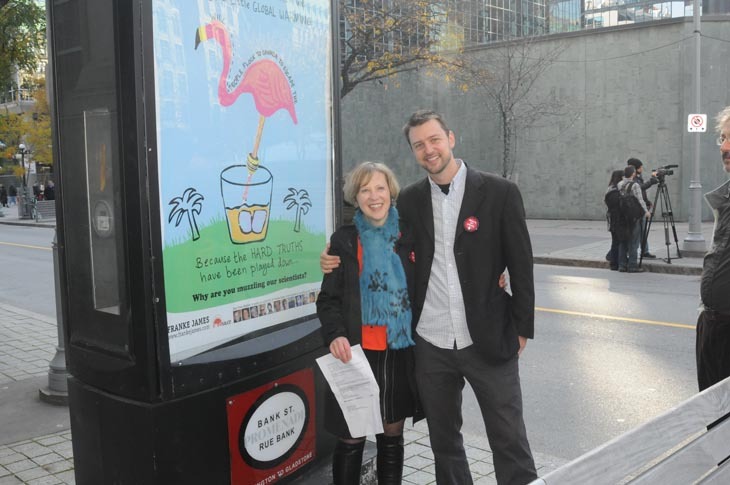 Max and I in front of the Flamingo from my 2009 Fat Cat Canada’s Giant Litter Box visual essay. 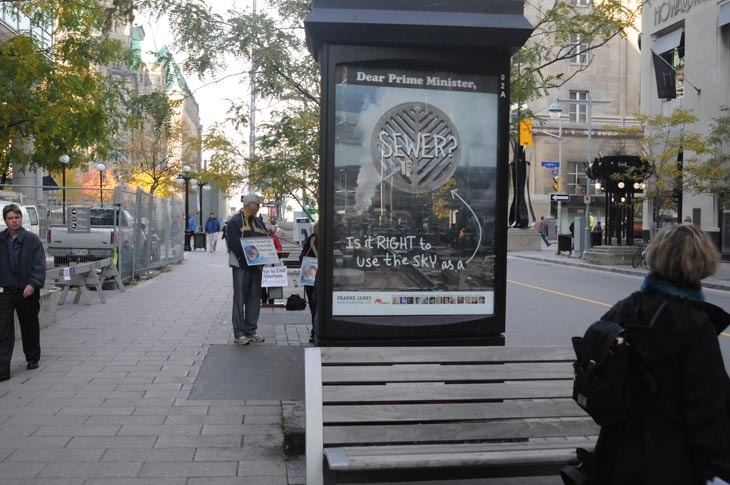 The six posters were on Bank Street, about a block of Parliament Hill. Thanks to Pattison Media for the great placement! “You say the other parties are dangerous because they will tax polluters. 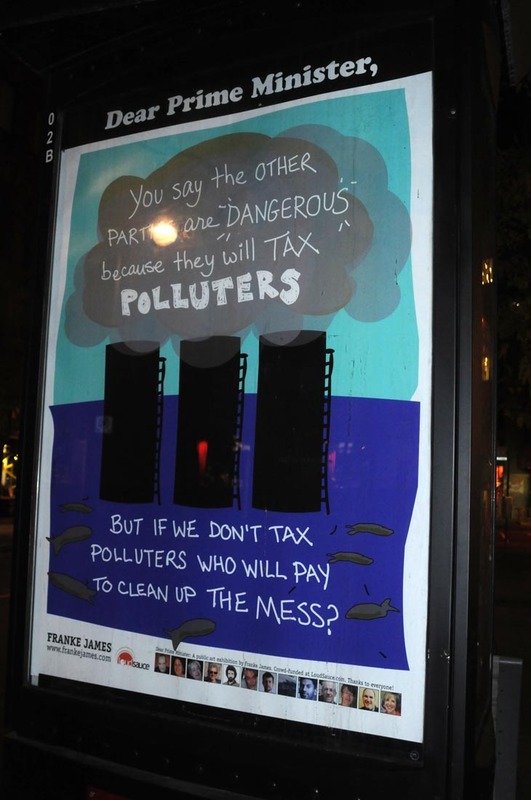 But if we don’t tax polluters who will pay to clean up the mess?” artwork from my 2008 Dear Prime Minister visual essay. “Dear Prime Minister, Is it right to use the sky as a sewer?” based on artwork from my 2009 Fat Cat Canada’s Giant Litter Box visual essay. Woohoo! You go, Girlfriend!!! I’m so glad this came together for you. Maybe you’ll still get to do your European tour somehow. Congratulations and thank you Franke James! Duly impressed with your live presentation in Minden yesterday; kudos to you; a brave, articulate, and compassionate soul! I was particularly struck by your retelling the lengths to which our federal government has gone in order to keep a lid on your message, all while covering their tracks and complicity! 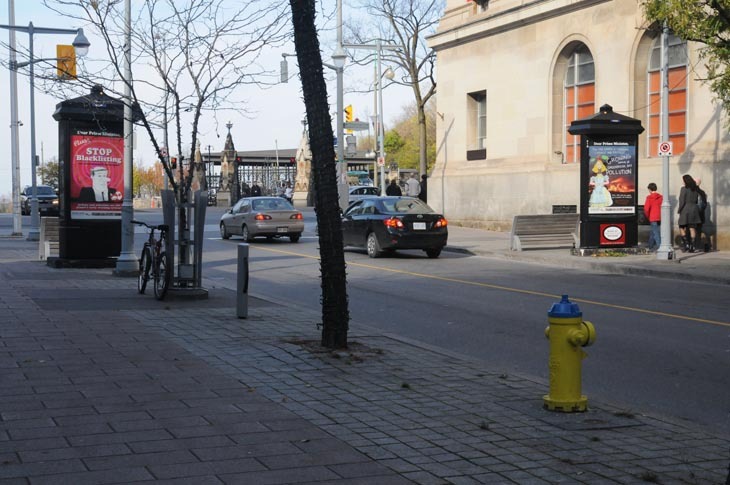 What wonderful luck your freedom of information request panned out just as you were strolling into Ottawa! SHAME on Steven Harper for blacklisting you and Canadian scientists alike and for denying what he has done- Scientists and artists after all perform a most valuable public service- acting as the early warning system for our fragile and wonderful home planet! If the Canadian Government truly meant no harm, then perhaps they would like to make a large donation and get this show up and running for the summer of 2012. Impressive, and as always also fun to look at! Hope its an eye opener for the Harper Government! What are you planning with the posters after Nov.27th? It would be great having them on display in Toronto for a while ( maybe a reason for another party :-), and then exhibit them in galleries, schools etc? 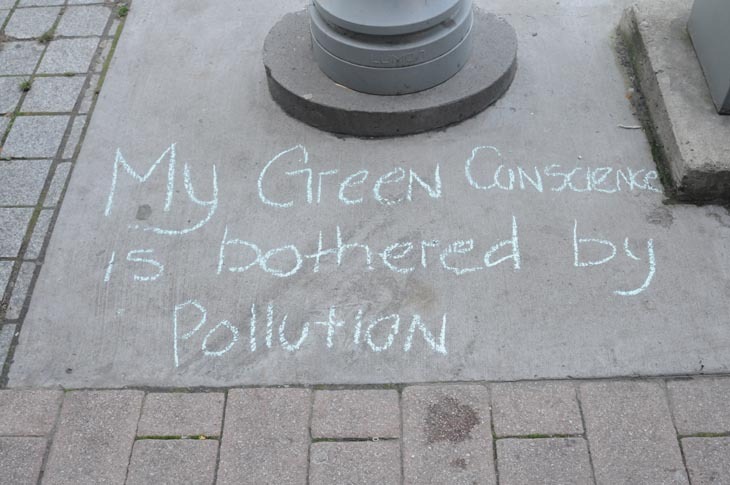 I think most Canadians want to do the best for our environment. The problem is that we trust our governments to do the right thing. All too often they don’t. 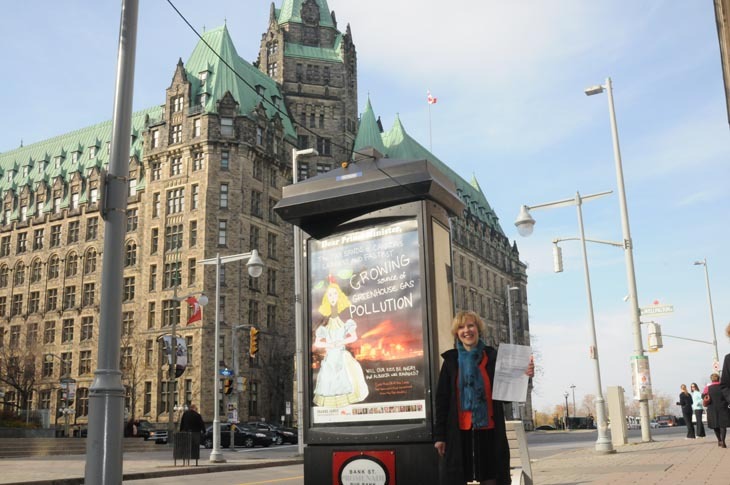 It looks like a fabulous 1-woman-show to Occupy Ottawa with EnviroArt ! I wish your show could travel across Canada. I so admire what you have done for climate progress. In this country it takes some fortitude and smarts to stand up to the stratagems of the government. What words can be used to describe the acts of gagging free expression and the public release of scientific research findings? What words can be used to label this kind of corrupted democracy? Congratulations! This is a huge achievement, a worthy contribution. Thanks a whole bunch. Franke, you are the best thing that has happened to our country in years and no, we are not “nice” — not when we consistently receive the Dinosaur of the Year award… we have to do more and I am sick and tired of hearing from people…”well, what can one do about all this?” Well, for one we can change our voting to proportional representation and vote these people out who in no way represent us and our views of what our world and the world has become. We can no longer deny what is happening … the small people like us know… it is the big people backed by the oil companies and banks who don’t care because they make money. Remember, dictators are [removed] in other countries whilst our own continue being dictators to supply the oil for other powers….if people can curb their appetites..then there would be no more demand to get more oil. BTW, where can we get some posters for us in the WEST Coast??? An inspiration for everybody!!! It’s in the whole world interest and we are 100% with you!!!! While I am not necessarily in agreement with all of your assumptions about climate change, I am FULLY in support of your right to engage n the discussion, free from any kind of censorship/interference by the Gov. LOVE the billboard concept! In his face! Go, girl! I have a feeling this will, in retrospect, be one of the best things that could happen to you. I would probably never have seen your work if it had not been for the item on The Current. I promptly shared it to Facebook. Others will do the same thing. Your work is delightful, glad to discover it. All the best. I appreciate your efforts at highlighting the need for governments to be more open and transparent rather than act as a fiduciary censor of what the citizens can say or learn. The inability of various level of government to recognize the need to embrace adaptation in the face of a changing climate is troubling. I am also troubled that the discussion of climate change is so focused on carbon emissions instead of understanding the impact of the total human footprint. Thanks so much for your timely intervention! Heard you this morning on Ontario Morning… go Franke! Good for you to have the patience to go through the Freedom of Information hoops and red tape. The Harper legacy will haunt our kids for years to come. Thank you for your wonderful art and your willingness to speak out. 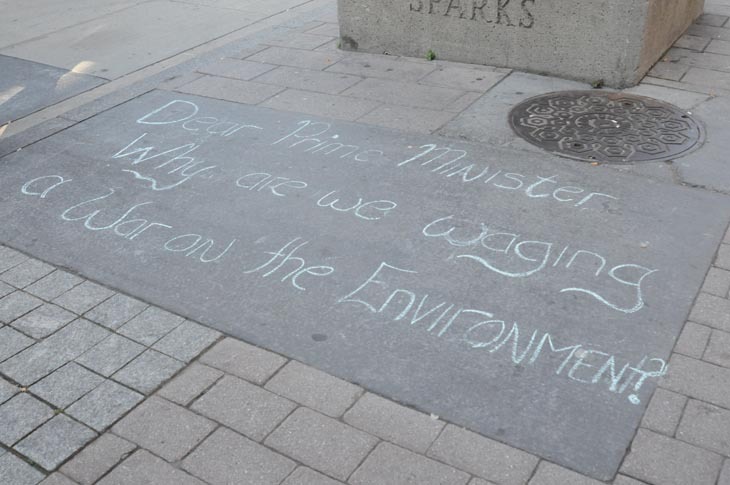 You speak for me and many others who feel hopeless in the face of the current government and the environmental mess that they insist on ignoring. Keep up the great work….the medium is the message, and the arts lead the way! I do not agree with your assessment of “global warming” (CO2) or “climate change” — I recommend you reexamine myths and lies surrounding that issue and, as well, check into “chemtrails” (aka geoengineering and now climate remediation) — AND I wholeheartedly agree with your efforts to put out to others that which you see and thin and believe. Remarkable to me that bureaucrats, high and low, would interfere so with your show. You hit a nerve, I suppose, the one near the brain center for hyprocrisy. Your art I find wonderful, delightful. May you enjoy peace, prosperity, and use your power more wisely than those who opposed you. Great idea! This would fit like a “T”. I’ll email you when it’s available for ordering online. It’s astonishing to see this story franke as it’s continues to unfold. i can’t tell you how happy it makes me to see these billboards!! You are everywhere!! I can’t say I’m surprised. However, I have to wonder how embarrassing it must be to work in the department of foreign affairs when all you can do is knuckle under to the PM and do things you must know are wrong. Maybe your next poster series could be about the people working in government who are being forced to toe the line when it isn’t what they believe? Perhaps most importantly, congratulations on your work and congratulations on finding the truth. Don’t let anything as minor as the PM and his cronies get in your way! I honestly like the concept of expressing ideas in artistic form just like what Franke did. I salute you Franke. Nicely done. It’s time to make action ! Going green is good for us. When we live healthier and know that we are helping the planet it can make us feel better. And who doesn’t want to live in cleaner and safe earth? Nice job, Franke! Keep it up! Keep up the good work. Only thru media can change happen. Why didn’t I know about this before! I guess because I live in the sticks. But I do watch the CBC and apparently they interviewed you. Did they broadcast the interview??? Good for you–amazing, delightful stuff. Here is the Canada that I’ve been missing. Hooray Franke James! So odd that we live in this unproportionally represented government times and have to all sit through pushy big oil politics. I’m really hoping the younger generation will be less apathetic than Generation Y turned out to be. From an economic perspective, the generation I was born into (children of the baby boomers) is the first one to make less than our parents in awhile, and sometimes I think that we are “non-boat rockers” in order to benefit from the financial support of our parents. But my children’s generation will not likely have that same unconscious or conscious motivation to keep in their parents good books (the thing I am more likely to be able to give my eventual offspring is knowledge about how to grow vegetables and live in passive solar houses, not significant financial support), so perhaps that variable being out of the way will help youth to be more pro-active about questioning authority and the oil cartel.